Unlike with people, there are a lot more specific ways to provide medical care to the different types of animals. And whereas patients and their doctors can communicate with words, the same cannot be done with critters, unless they are characters from Disney. Caring for animals is thus a passion, often developed early on since childhood; apparent from sparkling interest in books, shows, and movies on animals. 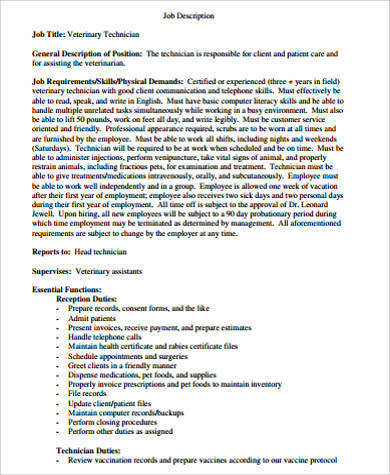 For any profession related to the care of animals, like in these Job Description Samples, this passion is the basic requirement. Not that it is the simplest, but that it should be at the core of your work. This rings true for vet techs or veterinary technicians. Read more on them in this post. 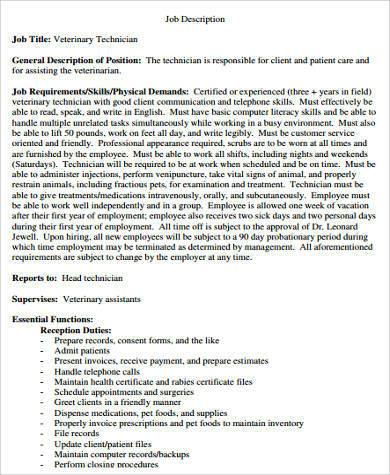 A veterinary technician works under a veterinarian to care for animals; similar to how nurses, as detailed in these Registered Nurse Job Description Samples, work under the supervision of doctors to care for patients. So essentially, “vet techs,” as they are most commonly referred to, are like nurses to animals. These two labels are often used interchangeably, generalizing every individual that works under the supervision of a veterinarian. There is, however, a difference. 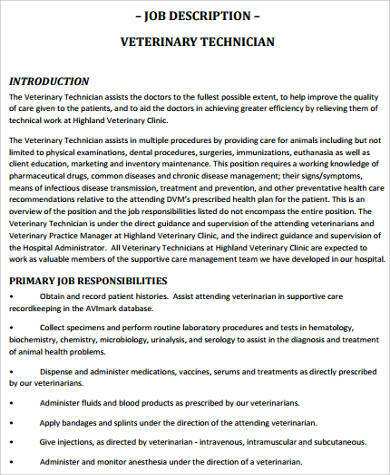 Whereas veterinary technicians perform diagnostic tests on animals upon the direction of veterinarians, veterinary technologists can actually diagnose and perform basic treatments. 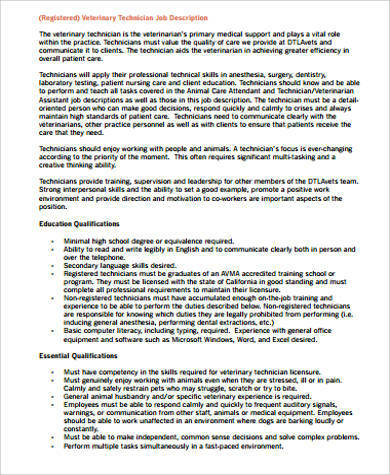 Moreover, veterinary technologists have to attend more years of academic training. This runs four to five years. 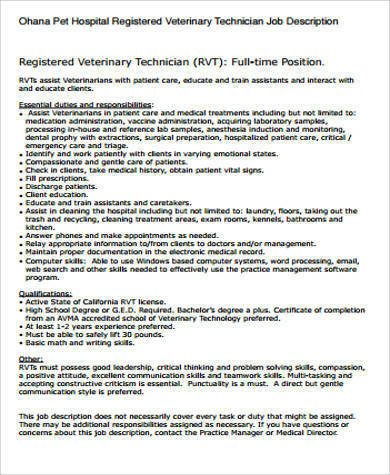 The minimum requirement for a vet tech, by contrast, is an associate’s degree for the same veterinary technology program, which typically covers only two years. 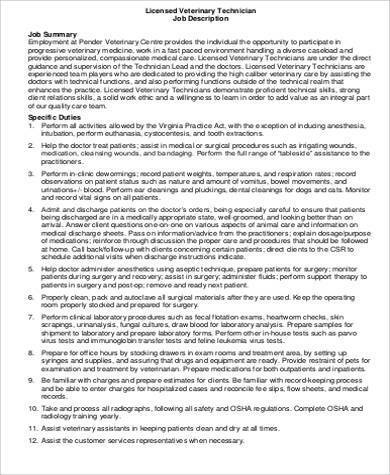 This program is offered in universities, colleges, and community colleges, for which students are also exposed to hands-on training and hours of medical observations. 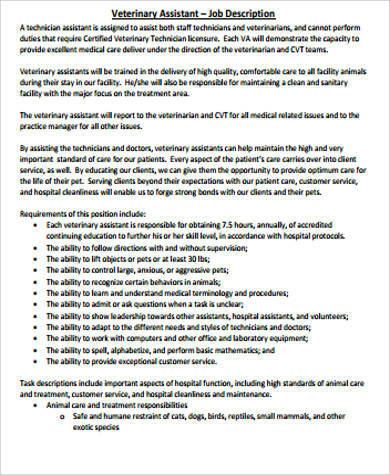 Most places require vet techs to pass nationally-administered licensure exams, certifying their ability to practice. ensuring the cleanliness and safety of laboratories and operating rooms. hands-on, as they assist veterinarians with their work, to be able to determine what they have to do. 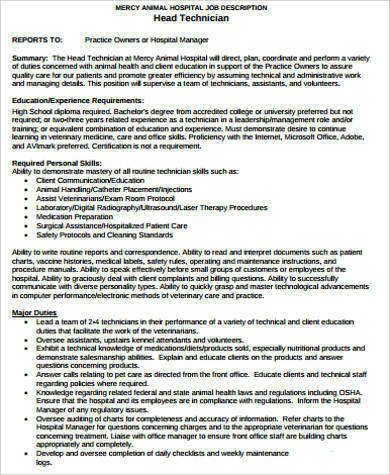 List in detail these skills, requirements, and qualifications for vet techs on their job descriptions. 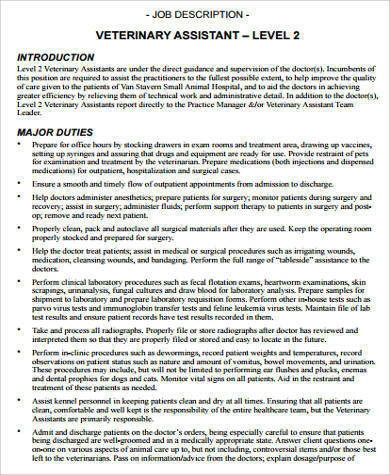 For the job descriptions of the veterinarians they assist and report to, see these Veterinarian Job Description Samples.